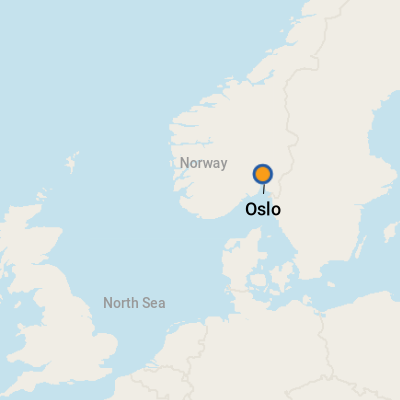 Compared with other Scandinavian capitals, Oslo is a cozy, somewhat provincial city. Fewer tourists come here than, say, Copenhagen, but that doesn't mean tourists won't find plenty that delights. Located on the Aker River at the head of the Oslo Fjord, Norway's capital has modern architecture, hundreds of lakes, lots of parks, world-class museums and public statues nearly everywhere (including a lot of notoriously naked ones). Oslo covers 175 square miles within its city limits and ranks as one of the world's largest capitals. However, with a population of 600,000, it is the least densely populated capital city in Europe. Norway was once part of Denmark and later part of Sweden, and many of Oslo's buildings -- including the Royal Palace and House of Parliament -- stem from Swedish rule. The country became independent in 1905. Later, Norway was occupied by German forces for five years during World War II (the Nazi history is something Norwegians are now willing to talk about, which may be of particular interest to World War II buffs). Traveling there, you'll notice the high standard of living (and that things aren't exactly cheap). It's so expensive, in fact, that many Norwegians go to Sweden to shop. Still, Norway is one of the richest countries in the world, thanks in no small part to its North Sea offshore oil. Oslo residents are big on nature and proud of their pristine forests and fjord. For cruise passengers, the ship's approach and departure through the Oslo Fjord provide fine views of the natural scenery and small fishing villages. Cameras ready! The city features two cruise ship docks, and both are centrally located on either side of the Akershus Fortress. They are within easy walking distance of downtown attractions and Oslo's exciting harborfront. The most you'll have to walk is 20 minutes (if you are at the closest dock, you are about five minutes from City Hall). At the cruise ship terminal, there are souvenir shops, a coffee shop and a tourist information booth that offers free maps and sightseeing tours. The terminal has Wi-Fi and a currency exchange. By Foot: This is an easy place to go it on foot. If you want to wander farther afield, say to the Munch Museum or Holmenkollen Ski Jump, it is very easy to follow the bus/tram/subway system. Ticket kiosks accept local coins or credit cards. By Car: Taxis are available just outside the pier area and throughout the city. Drivers generally speak English, but conversational skills may vary. All taxis accept credit cards but typically do not accept foreign currency. By Bus: There is a hop-on, hop-off bus service that departs every 30 minutes from the cruise terminal. The buses are red double-deckers, and they have multilingual narration and free Wi Fi. They accept credit cards and any major currency. By Boat: There is a ferry service (Ferry No. 91 at Pier 3) that takes passengers to the Bygdoy peninsula, which houses the well-regarded Viking Ship, Kon-Tiki and Fram museums, among others. The ferry ride takes 10-15 minutes. Currency is the Norwegian krone (NOK). The cheapest way to get money is to use your debit card at one of the plenty of ATMs. For updated currency-conversion figures, visit www.oanda.com or www.xe.com. Credit cards are widely accepted. Norwegian, though most folks speak English. Not surprisingly, many of Norway's signature dishes come from the sea. Salmon, trout, cod and halibut are on most menus. So is spekemat, a plate that includes cured ham, sausage and mutton. Smorbrod, the popular Scandinavian open-face sandwich, makes a nice appetizer and koldbord or "cold table" is the equivalent of Sweden's smorgasbord. A couple of local favorites: fiskesuppe, a fish soup rich with egg yolks and cream, and freshly boiled shrimp on white bread with mayonnaise and lemon juice. Locally produced beer is noted for its high quality. Suggested tipping is 5 to 10 percent for good service. Norwegian wool sweaters, troll dolls, painted wooden figurines, crystal, glassware, leather and fur jackets are among Oslo's most popular souvenirs. Many souvenir shops -- including those at the cruise ship terminal -- accept U.S. dollars and euros and give change in the Norwegian krone.